Bruce Eugene Kison was born on February 18, 1950, in Pasco, a fertile farming community on the Columbia River in southeastern Washington. His parents were Fred, a building supplier, and Bertha (Rogers) Kison, a homemaker. Bruce was introduced to baseball while attending Mark Twain elementary school, and by the age of 12 was an accomplished pitcher and outfielder. He suffered a fateful injury as a 14-year-old in a local Pony League game. “I used to throw almost completely overhand,” explained Kison, “but I got hit in the crazy bone on a pickoff throw to first. [After that, it] hurt me to throw overhand, so I started throwing side-arm. I found out that my ball moved more that way.”3 Kison began attracting scouts in his last two years at Pasco High School, where he tossed three no-hitters. The Pittsburgh Pirates selected him in the 14th round of the major-league amateur draft in 1968. Kison began his professional baseball career with the Pirates’ rookie affiliate in the Gulf Coast League. “We had 30 pitchers, and there were supposed to be just 15 by the end of the season,” he said of his arrival in Bradenton. “It was like a pressure cooker, everybody trying to cut each other’s throat. … You learn to evaluate yourself and your talent honestly.”4 Kison found a trusted mentor in pitching coach Harvey Haddix, whom he once credited as his most influential teacher.5 The following year Kison was the Geneva Pirates’ top starter in the short-season Class A New York-Penn League. In 1970 the Pirates took the reins off their young, rail-thin hurler who packed only 175 pounds on his 6-foot-4 frame. Kison dominated competition in the Class A Carolina League, posting an 0.82 ERA in 33 innings for the Salem (Virginia) Rebels, earning an early-season promotion to Waterbury (Connecticut) of the Double-A Eastern League. He tossed a two-hit shutout and a three-hitter in his first two starts, but soon began suffering from a sore arm that proved to be a career-long concern. Despite struggling with his control (once hitting seven batters in a game and 21 in just 130 innings), Kison went 10-4 with a 2.28 ERA for the league champions. The Pirates added him to their 40-man roster at the end of the season. Kison participated his first big-league spring training in 1971, but with just 281 innings of minor-league ball under his belt, he was not expected to challenge for a roster position. Assigned to the Triple-A Charleston (West Virginia) Charlies, the elusive side-armer proved his big-league readiness by winning 10 of 12 starts and posting a 2.86 ERA in 85 innings, and was named to the International League’s all-star team. The Pirates called up Kison on June 30 to serve as a temporary replacement for rugged right-hander Bob Moose, who was serving a two-week stint in the Army Reserve. Kison followed his ho-hum debut on July 4 against the Chicago Cubs (four runs and four walks in a six-inning no-decision) with three impressive performances to secure his place on the staff. He earned his first win by limiting the reigning NL pennant-winning Cincinnati Reds to five hits over 7⅔ innings on July 8 and tossed a sparkling two-hit shutout against the San Diego Padres on July 23. While the Pirates rode on the backs of the league’s most potent offense to the NL East title by seven games over the St. Louis Cardinals, Kison helped solidify a staff that lacked a classic ace. With 13 starts among his 18 appearances, Kison finished with a 6-5 record and a 3.40 ERA in 95⅓ innings. Pirates fans and the local media embraced the youthful looking Kison and his energetic style of playing. “At 21, he looks like 15,” wrote Pat Jordan in Sports Illustrated. “He has a gawky adolescent body, all arms and legs and little torso. His face is long and fine boned and dusted with peach-like fuzz.”6 He was appropriately nicknamed Baby Face and Stretch, and later in his career was known as Buster. Kison surprised the baseball world with his unexpectedly strong postseason performances in the Pirates’ march to the title in 1971. In Game Four of the then best-of-five NLCS, he relieved starter Steve Blass to begin the third inning with the score tied 5-5, and held the San Francisco Giants scoreless over 4⅔ innings to earn the 9-5 victory and clinch Pittsburgh’s first pennant since 1960. “Chills went down my back,” said a candid Kison after his thrilling feat. “If you don’t go out to the mound scared, you better get out of the game.”7 His victory in Game Four of the World Series helped make him a fan favorite throughout the 1970s in the Steel City. While his teammates celebrated their 2-1 World Series victory in the clubhouse after Game Seven, Kison made national headlines by rushing to his wedding. He and his best man, Bob Moose, were picked up by helicopter (arranged by Pirates radio announcer Bob Prince) at Memorial Stadium in Baltimore and flown to the airport, where they boarded a private Learjet bound for Pittsburgh.8 Less than three hours after reaching the pinnacle of team success in baseball, Kison married Anna Marie Orlando of Verona, Pennsylvania. Together they raised two children. Kison labored through a pain-filled campaign in 1972. Despite Feeney’s warning that Kison “has too much potential to be used both ways,” the young hurler alternated between starts and relief outings and failed to establish a consistent rhythm for skipper Bill Virdon, who had succeeded the retired manager Danny Murtaugh.13 Kison, the youngest member of the staff, went 9-7 and posted a 3.26 ERA in 152 innings for the NL East champions. He made two relief appearances and picked up a victory in Game Three of the NLCS before the Pirates suffered a dramatic walk-off loss in Game Five to the Reds. Kison’s shoulder pain failed to respond to rest during the offseason. He did not pitch in the exhibition season’s Grapefruit League in 1973 and began the season on the disabled list. With his career in jeopardy, Kison reported to Triple-A Charleston. He struggled with his control, walking 82, hitting a league-high 14 batters, and throwing 11 wild pitches in just 114 innings, and also landed on the DL with shoulder tendinitis. He offered a sliver of hope in his September call-up to Pittsburgh by winning all three of his decisions and logging 43⅔ innings in seven starts. Kison, pain-free for the first time in three years, was back with the Pirates in 1974. Murtaugh, back in the Pittsburgh dugout yet again after Virdon’s sudden dismissal in early September 1973, relegated Kison to the bullpen to start the season, ostensibly to protect his arm from the cold weather. Kison appeared in a career-high 40 games, but encountered a new impairment just as his shoulder seemed to feel stronger. He suffered from chronic blisters that developed on the middle finger of his right hand typically in the sixth inning of his starts.15 He lasted eight innings or more just three times in his 16 starts. In an otherwise mediocre year, Kison won all three of his decisions in September, including a complete-game three-hitter to defeat the Cubs, 2-1, in his last appearance to conclude the season with a 9-8 record and 3.49 ERA in 129 innings. Surprisingly, Murtaugh tabbed Kison to start Game Three of the best-of-five NLCS in Los Angeles with Pittsburgh on the brink of elimination. In arguably the Pirates’ only highlight in their four-game series loss, “Stretch” blanked the slugging Dodgers on two hits over 6⅔ innings to earn the victory, 7-0, despite issuing six walks. More impressively, he extended his scoreless-innings streak in the postseason to 20 over six appearances. Kison matched his total of complete games in the previous season by going the distance in his 1975 debut, holding the New York Mets to three hits and three runs (two earned) in a 5-3 win at Three Rivers Stadium. Over the first two months of the season, he emerged as a consistent and dependable winner, tossing a career-best three consecutive complete games (all victories), and beating the reigning NL champion Dodgers twice in nine days in July to improve his record to 9-4. Even more encouraging was Kison’s ability to go deep in games. But then the slugging Pirates scored just six times in his next six outings, and he lost a career-worst seven consecutive starts. Still, as the Pirates marched to their fifth NL East crown in six years, Kison was a solid third starter behind Jerry Reuss and Jim Rooker, finishing with a 12-11 record and 3.23 ERA in 192 innings. In the Pirates’ three-game sweep at the hands of Cincinnati’s Big Red Machine in the NLCS, Kison’s string of consecutive scoreless innings in the postseason was halted at 20⅓ when he surrendered a run in two innings of relief in Game Two. Kison got off to a rough start in 1976, the year the Pirates, along with several other teams, made a bold fashion statement by donning old-style “pillbox” caps with horizontal stripes to celebrate the centennial anniversary of the National League. With an ERA hovering around 6.00 after his first five starts, Kison made an adjustment that helped propel him to a career year. “I used to pitch from the third-base side of the rubber,” he explained. “My fastball was tailing away from left-handed hitters. The good ones were taking the pitch because it wasn’t a strike.”17 In what seemed like an annual occurrence, Kison pitched his best baseball near the end of the season. In a distant second place on August 24, 15½ games behind the Philadelphia Phillies, the Pirates went on an 18-4 tear to pull within three games of the division leaders. Kison won all four of his starts, allowing just four earned runs in 31 innings during that span. Kison typically worked with backup catcher Duffy Dyer, and credited his batterymate for his success, “I’ll admit that Duffy helps me concentrate.”18Although Pittsburgh stumbled down the stretch to finish in second place, Kison sent career highs in wins (14) and innings (193). For the second consecutive season, he ranked 15th in the NL in ERA (3.08), his career low. A changing of the guard was marked in 1977 when Chuck Tanner replaced the thrice-retired and increasingly frail Murtaugh, who had died at the age of 59 on December 2, 1976, after suffering a severe stroke two days before. Kison, widely expected to duplicate his success from the previous season, slumped to a 9-10 record, and was plagued by a nagging groin injury and persistent blisters on his pitching hand. More disconcerting to the Pirates was his bloated ERA (4.90), the second highest in all of baseball. Pittsburgh’s hopes to reclaim the NL East crown were dashed in a costly victory against the Philadelphia Phillies on July 8. Kison, after yielding a go-ahead two-run homer to Garry Maddox, drilled Mike Schmidt two batters later. In the ensuing bench-clearing brawl, Willie Stargell injured his elbow, and played in only eight more games all season. Though not physically intimidating on the mound like a J.R. Richard of the Houston Astros, Kison had the reputation as a “brush-back” pitcher and was once dubbed “The Assassin” for dusting off hitters who crowded the plate. Joe Goddard of The Sporting News considered him and Jim Barr of the San Francisco Giants masters of the lost art of throwing high and tight, à la Don Drysdale and Bob Gibson.19 Kison’s approach to the plate led to several high-profile brawls, such as the one with Schmidt, and, after he moved to the AL in 1980, with Buddy Bell, Gary Gaetti, and George Bell. 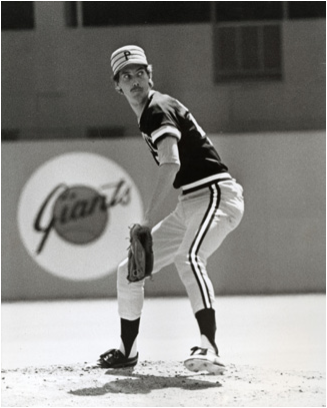 Kison lost his position in the starting rotation in 1978 to offseason acquisition Bert Blyleven, who had been obtained from the Texas Rangers, and rookie Don Robinson, and started just 11 times among his 28 appearances, logging only 96 innings. With his role on the club in limbo and trade rumors swirling, Kison unexpectedly won a spot in the rotation in spring training in 1979 after the departure of left-handed veteran Jerry Reuss. Reuss had been sent to the Los Angeles Dodgers for pitcher Rick Rhoden, who subsequently went on the DL for the season after only one start. Then 36-year-old Jim Rooker was injured. In his season debut, Kison struck out a career-high 10 in 6⅓ innings in a no-decision against the Montreal Expos. The team’s unheralded pitching staff proved to be one of its strengths. Eight hurlers logged at least 100 innings and six notched at least 10 wins. Kison finished second on the club in victories (13), trailing only John Candelaria’s 14, while his 3.19 ERA (in 172⅓ innings) was the best among starters and good for 11th in the league. After the Pirates’ three-game sweep of the Cincinnati Reds in the NLCS, Kison endured a nightmare as the Game One starter in the World Series against the Baltimore Orioles. Complaining of numbness in his arm on a cold, 41-degree night at Memorial Stadium, he yielded three hits, issued two walks, and threw a wild pitch leading to five runs (four earned) and was lifted after registering just one out in Pittsburgh’s 5-4 loss. He was scheduled to start Game Five but was replaced by Rooker because of continued arm discomfort.22 The “We Are Family” Pirates, led by Willie Stargell, became the first NL team since the 1925 Pirates and just the fifth major-league team since 1900 to win the World Series after being down three games to one. Kison opted for free agency in the offseason, and his nine-year tenure with the Pirates came to a close on November 16, 1979, when he signed a five-year contract reportedly worth approximately $2.5 million with the California Angels. Never a star for the “Lumber Company,” Kison fared well in pressure-packed games, notching 24 of his 81 wins as a Pirate in September (against just nine losses). Kison won only 29 games and logged just 451⅓ innings in his injury-plagued tenure with the Angels. After losing his first two starts in the AL, he blanked the Minnesota Twins on one hit, a double by Ken Landreaux with one out in the ninth inning of a 17-0 rout at Metropolitan Stadium. Criticized as a bust and hailed as a poster child of the dangers of free agency, a pain-ridden Kison was shelved for the remainder of the season after a July 14 loss with a 3-6 record and a 4.91 ERA in 73⅓ innings. Kison was diagnosed with damage to the ulnar nerve in his right elbow and metacarpal tendon in his wrist. He underwent career-threatening surgery and subsequently reported that his hand was paralyzed and that he had no feeling in three of his fingers.23 Reflective of his team-first attitude, Kison made news by offering the Angels a refund of his salary to compensate for the “troubles” he caused, but GM Buzzie Bavasi declined the offer.24 After a grueling rehabilitation, Kison defied predictions that he would never pitch again by returning to the mound 13 months later in what sportswriter Peter Gammons considered a feel-good story of the year.25 For the 1981 season, Kison was 1-1, with a 3.48 ERA in 44 innings pitched. The ever-competitive Kison rekindled some of his magic in 1982. Unexpectedly securing a spot in the rotation, he went 6-2 in his first 12 starts before Texas Ranger Johnny Grubb’s line drive off his shin on June 22 sent him to the bullpen for more than two months. Prior to the August 31 trade deadline, the Angels reportedly offered Kison to the New York Yankees for left-handed veteran pitcher Tommy John. Back in the rotation in September, he won three consecutive starts to finish with a 10-5 record and 3.17 ERA in 142 innings for the AL West champions. In Game Two of the best-of-five ALCS, Kison tossed a complete-game five-hitter, striking out eight, to beat the Milwaukee Brewers, 4-2. Four days later, Kison started the decisive Game Five. Pitching on short rest, he held the potent offense of the “Brew Crew” to just three hits in five innings, departing with the lead, 3-2, but Milwaukee gained a 4-3 comeback win for the AL pennant. In defiance of the odds, Kison got off to another fast, strong start in 1983, winning six of seven decisions in nine starts. He tied his career high with 10 strikeouts on April 16 and also tossed three consecutive complete games from May 11 through 22 (culminating with his eighth and final shutout) for just the second time in his career. But the story was too good to be true. He developed back pain that prematurely ended his season in order to undergo career-threatening surgery on a lumbar disc on his spine in September. Few questioned Kison’s toughness and commitment to the game. After yet another arduous rehabilitation, he returned to the mound 10 months later in 1984 and labored through 65⅓ innings (5.37 ERA) in his final season in California. Kison finished his career with the Boston Red Sox in 1985. His importance to the club transcended his five wins and 92 innings. Manager John McNamara praised the 35-year-old Kison’s positive influence on his young staff, which included five starters 27 or younger (Roger Clemens, Oil Can Boyd, Bruce Hurst, Al Nipper, and Bob Ojeda). A lifelong student of the game, Kison transitioned into coaching. He returned to the Pirates in 1987 as a minor-league roving pitching instructor, and served in that capacity until 1990. In 1991 he began a productive eight-year working relationship with the Kansas City Royals. After one year as a minor-league pitching instructor, he served as bullpen coach (in 1992) and pitching coach (1993-1998) on the parent club under managers Hal McRae, Bob Boone, and Tony Muser. After serving as the pitching coach under Ray Miller in 1999, Kison also scouted for the Baltimore Orioles for more than a decade.28 He lived with his wife, Anna, in Bradenton, Florida. He died on June 2, 2018, at age 68 after a battle with cancer. An earlier version of this biography appears in "When Pops Led the Family: The 1979 Pitttsburgh Pirates" (SABR, 2016), edited by Bill Nowlin and Gregory H. Wolf. 1. The Sporting News, October 30, 1971: 3. 2. The Sporting News, May 31, 1975: 12. 3. Joe Donnelly, “Kison: Look Honey, If I’m Late ...,” October 14, 1971. Kison’s player file at the National Baseball Hall of Fame, Cooperstown, New York. 4. Pat Jordan, “An Old Hand With a Prospect,” Sports Illustrated, June 14, 1971. 5. Mark Cardon, “Knocking Off Birds Is a Hobby For Kison,” Sarasota Herald-Tribune, February 20, 1972: 1C. 6. Pat Jordan, “End of Innocence,” Sports Illustrated, April 10, 1972. 7. Associated Press, “Cool Kid In Control. Kison Hurls Pennant-Clinching Victory For Bucs,” Toledo (Ohio) Blade, October 7, 1971: 46. 8. The Sporting News, October 30, 1971: 16. 9. The Sporting News, February 12, 1972. 10. The Sporting News, December 25, 1971: 28. 11. The Sporting News, April 29, 1972: 11. 12. Dennis Morabito, “Kison no dumbbell, that’s why he’s back,” Beaver County (Pennsylvania) Times, June 3, 1975: B1. 13. The Sporting News, December 25, 1971: 28. 15. The Sporting News, April 12, 1975: 17. 16. The Sporting News, May 31, 1975: 12. 17. The Sporting News, July 3, 1926: 29. 18. The Sporting News, October 2, 1976: 9. 19. The Sporting News, July 29, 1978: 22. 20. Phil Axelrod, ‘Bucs Breeze, 7-0, on Kison’s One-Hitter,” Pittsburgh Post-Gazette, June 4, 1979: 9. 21. Don Donovan, “’79 Pirates Gave It Their All And Then Some,” Pittsburgh Press, October 1, 1979: B4. 22. The Sporting News, October 27, 1979: 12. 23. The Sporting News, August 29, 1981: 27. 24. Associated Press, “Ailing Kison Offers Refund,” Observer-Reporter (Washington, Pennsylvania), July 17, 1980: D1. 25. The Sporting News, August 29, 1981: 27. 26. Bob Hertzell, “Torn Rotator Cuff Throws Kison Into New Pitching Assignment,” Pittsburgh Post-Gazette, February, 5, 1987: D1. 27. Associated Press, “Kison decides to retire,” Lewistown (Maine) Daily Sun, February 25, 1986: 17. 28. Dan Connolly, “Orioles will have two more scouts on pro assignments,” The Sun (Baltimore), February 9, 2012. articles.baltimoresun.com/2012-02-09/sports/bal-orioles-will-have-two-more-scouts-on-pro-assignments-20120209_1_scouts-orioles-amateur-andy-macphail.